Thomas Vernon Land was the son of Jesse B and Velma Singer Land. He was born on November 6, 1920 in Richmond, Madison County, Kentucky. He had at least one other brother. By the 1940 census, he had completed three years of high school. He was married to Lounata Newby on December 24, 1940. 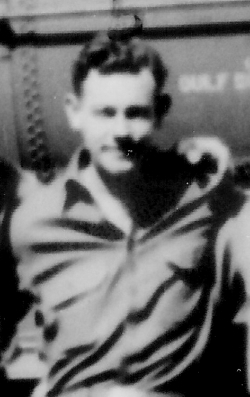 After the Kassel Mission, Thomas became a POW and probably was interned at Stalag Luft IV with Giesler, Howe, and Maupin. Thomas died on August 18, 2006, in Somerset, Pulaski County, Kentucky. He was a retired auto parts salesman of Land Auto Supply, and a lifetime member of the Disabled American Veterans and the American Ex-Prisoners of War. Thomas was noted to be a Kentucky Colonel and a member of the Richmond Nazarene Church. Buried in the Mill Springs National Cemetery in Nancy, Pulaski County, Kentucky, he was survived by two daughters and one brother, but was preceded in death by his wife, who died in 1998.